The kitchen is one of the most important and frequently used living areas in any contemporary home and finding an adequate lighting solution that is practical, energy efficient and aesthetically pleasing for this part of the home will make an enormous difference to your everyday quality of life. Whether you are carrying out household tasks, preparing the breakfast or an evening meal for the family, engaging with guests or simply unwinding whilst spending quality time with family and friends, our LED kitchen lights and up-to-the-minute lighting ideas are the perfect solution for anyone seeking to create a comfortable, well-lit environment that is warm, atmospherically inviting and seamlessly compatible with any interior design scheme. Our LED ceiling lights, recessed wall lighting solutions and under shelf LED strip lights for kitchen units and cabinets will provide the perfect level of brightness for any domestic or commercial cooking environment. Clear and powerful, yet cost effective and easily to maintain, our LED kitchen lighting ideas are the perfect choice for any modern kitchen space where optimal visibility is an essential requirement, particularly when cooking and preparing food whilst keeping things spotlessly clean. At Fibre Optic FX Ltd, we stock a superb range of sleek and stylish, decidedly contemporary kitchen LED lighting products including brushed aluminium LED downlights, which are available in a cool or warm white finish and designed primarily for ceilings, energy efficient LED strip lights for under cabinet lighting and dimmable spot lights that can easily be adjusted to help create various moods, depending on your changing needs and requirements. LED spotlights are exceptionally attractive and are available in a wide variety of good-looking finishes which will integrate flawlessly with a variety of decorative schemes. Highly discrete, these modern day LED kitchen lighting products can be positioned wherever necessary to illuminate and accentuate various design features such as cupboards and cabinets, wall mounted picture frames and kitchen clocks. They can also be used to highlight other elements of your interior design such as kitchen islands and workstations, breakfast bars and floor spaces, or as a means of creating an illuminated wash effect on your kitchen walls. We also offer a wide range of LED kitchen cabinet strip lights and panel lighting which are designed to provide unrivalled functionality whist providing an added degree of ambience and luminosity. Under cabinet LED strip lighting, kitchen unit downlights and recessed LED wall lamps are highly versatile and useful for illuminating food preparation areas whilst offering an extra light source for the kitchen as a whole. In modern times, the kitchen has become much more than just a place for cooking and cleaning. It's also an area where the family can meet up, share their daily experiences and enjoy each other's company, and a place where the kids can do their homework after school or college. Unlike halogen lights or traditional tungsten filament bulbs, our LED kitchen unit lights produce virtually no heat at all and this helps to create a comfortable, well-lit area where children can read and write comfortably whilst the grown-ups prepare an evening meal. 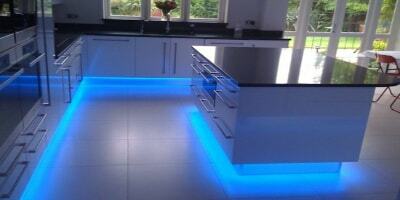 Another benefit of using LED strip lighting for the kitchen is that LED lights do not flicker. This is an important consideration, as conventional strip lights do actually flicker at a high frequency which can cause headaches and migraines whilst affecting concentration.